So yep! I'm back with another review featuring a product that I've used steadily for nearly a year now. I first noticed Freeman products when Michelle Phan showcased one of their masks in her video tutorial. She was using the Cucumber Peel Off Mask but I thought of going for the Facial Clay Mask with Avocado & Oatmeal since it's targeted for oily/combination skin. I don't know about you guys but I think Caring Pharmacy offers a lot more variety of Freeman Masks than Guardian and Watsons. 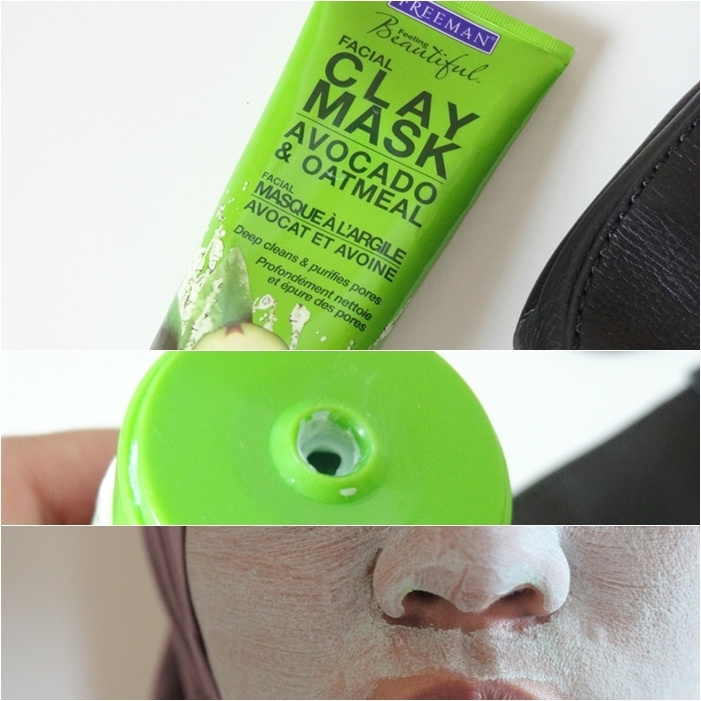 However, this Clay Mask in Avocado and Oatmeal is something where you can find easily in these three drugstores. Price varies between RM16 to RM20, so it's better to look up for discount. I bought mine during sale at Watsons for RM16.07. "Nourish and purify with one amazing mask. Rich clays dive deep to purge dirt and oils from pores. Nutrient-rich Vitamin E, Avocado and Oatmeal moisturise for lasting skin softness. Skin looks and feels squeaky clean and is soft to the touch. Perfect for normal to combination Skin"
One thing for sure, you can easily spot Freeman Masks in the drugstores as they have bright, colourful and attractive packaging. The tube itself is huge and for the amount I paid, it surely great. I'm very satisfied with the flip cap opening as it's so tight and the product inside won't leak out. I also find this kind of packaging is hygienic as I wouldn't need to scoop in my hands in order to get the product. This is very unusual for me to forgot taking a photo of its ingredients, lol so I'm just going to type it out here. As you can see, the mask uses 2 types of clays- bentonite and kaolin. Bentonite is a healing clay. It helps to normalise oily skin and reducing the oil that has been clogging pores. Meanwhile, kaolin is no longer a stranger in cosmetic ingredients. You have probably seen it everywhere. Just like Bentonite, Kaolin clay helps in reducing the production of sebum. The consistency is thick. Might need some effort squeezing it out from the tube once it dries. To avoid this, make sure you close the tube each time after using. The clay is green in colour, pale green to be specific, which resulted from Yellow 5 and Blue 1 artificial colourings. On the face, the clay mask spreads out easily and dries after 5-7 minutes. I don't have warm water in the sink because who needs one if you're living in Malaysia. It's warm every time. So I just rinse the mask off using normal temperature water. One thing I just realized when writing this review is the company does not instruct for how long we should leave the mask on but I usually do mine about 15 minutes. As for the clay mask, I use it every 2 weeks or whenever I feel like I'm breaking out with bumps over my forehead. I like this. It gives me a soft and hydrating feeling to the skin once I rinse it off. I don't experience any breakouts while using it but I can't let the clay mask sitting on top of my face for more than 15 minutes. It gets itchy when it dries. Well, that is technically how I know I should rinse it off from my face. Content : 150ml / 6.0 Fl. Oz. - Leading pharmacies like Caring, Guardian & Watsons. Oh very interesting product darling! Avocado and oatmeal, sounds like breakfast!!! HAHAHA!!! I shall try itt!!! Thanks for the reviewwwwww. Please do know that accepting the award is totally up to you and I wouldn’t be offended if you choose not to do it. I do not want to impose and make you feel obligated to dedicate a post to the award. Looking forward for your tag! Hi Ieyra, I've nominated you on my 1st Liebster Award! I love your blog and I hope you'll participate :D. Looking forward for your tag! Hi Ieyra, I've nominated you on my 1st Liebster Award http://lemmeswatchit.blogspot.co.id/2015/10/my-1st-liebsted-award-nominees.html! I love your blog and I hope you'll participate :D. Looking forward for your tag! You're welcome babe!! Try lah! I prefer this mask since I heard that the Freeman Lemon + Mint clay mask tu a bit more drying! You're welcome Ieyra! Anyway, I nominated you on my first Liebster Award, I have been meaning to tell you since Saturday but I don't know why my comment with the link of my post always get spammed by disqus! Asalam-o-Alykum, My name is Qasim, from last 26+ years Allah and Muhammad s.a.w keep coming into my dreams, over 460+ times Allah comes in my dreams and 250+ times Mohammad s.a.w comes in my dreams, Muhammad s.a.w is the last Messenger of Allah and I am the Ummati of Muhammad s.a.w, My dreams about to Major Signs of Qiyamah, Gog Magog, Esa a.s, and End of Time. I have shared many dreams on my fb page.